#Notinmyname. Hadia Tirmizi, the mother of a student profiled in my book Faith Ed., posted that Twitter hashtag on her Facebook page last week in the aftermath of the terrorist attacks in Paris. She is Muslim, lives in Wellesley, a Boston suburb, and knows the backlash that can follow when terrorists are identified as Muslims. The same week she posted her statement against the terrorists, she also posted photos of her family celebrating her youngest son's tenth birthday and photos of her and her husband, both physicians, on a vacation to Paris in a past year. Her heart, like mine, like yours, ached for the victims of the bombings and shootings in Paris and in Lebanon. But she and her family, unlike many of us who are not Muslim, may have to bear more of the brunt of the aftermath as many people lash out at Islam and Muslims on Twitter, Facebook, news opinion pages and comment threads on articles. 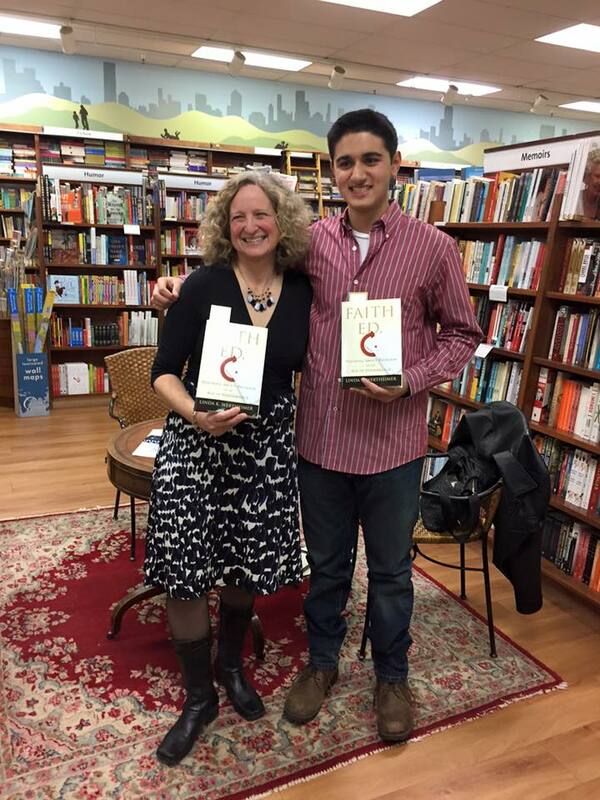 I featured Zain Tirmizi in a chapter in my book about Wellesley Middle School's controversial field trip to a mosque, and his parents became a part of the story. In an interview in 2011, Hadia Tirmizi and her husband, Ali, spoke about how they were so painfully aware that many Americans started viewing them as people to fear after terrorists, who were Muslim, flew airplanes into the World Center towers. "The first day I felt like an outsider in America was a day after 9/11," she told me, describing how she felt as she made her usual patient rounds in suburban Boston hospital. She and her husband years later would struggle to explain to a 12-year-old Zain why some people hated Muslims as Islamophobia grew in the US. They struggled to explain why a pastor in Florida would burn the Koran. Since the most recent terrorist attacks, some politicians have suggested barring Syrian refugees, if they are Muslim, from the United States, while others, including Massachusetts Gov. Charlie Baker, have not made a religious distinction. Donald Trump, a Republican presidential candidate, has faced uproar for his suggestion that mosques be shut down. An Internet meme, with a photo of Malala, is making the rounds. It says, "With guns, you can kill terrorists. With education, you can kill terrorism." The answer, of course, isn't that simple, but education can have power. Zain and other Muslim youths around the country told me about jabs peers had made to them, often after news broke about an Islamic terrorist. "You're a Muslim. I'm going to check you for bombs," a peer said to Zain when he was in fourth grade. Zain's father coached his son to educate the other boy about Islam and that it preached peace, not violence. The boys became friends. But the education component truly came two years later when Zain was in sixth grade and took the Global Beliefs course at Wellesley Middle School. The 11- and 12-year-olds spend half a year learning about four religions, including Islam. Part of the lessons includes learning about stereotypes of religions. In eighth grade, shortly after the Boston Marathon bombing, a class Zain was in had a substitute teacher. The teacher began expressing anger toward Muslims and how they were using our country's resources and then killing us. The next day, when the regular teacher returned, many students spoke up about the substitute's words and how she wrongly stereotyped all Muslims as terrorists. Zain believed the sixth-grade course's message had sunk in with his peers. Now, Zain is 16. He and his family came to a talk I gave at Wellesley Books on Oct. 14. I asked him how things were going. Had the lessons from sixth grade stuck? He said mostly, though on the bus one day, a peer made a derogatory comment toward Muslims and directed it at Zain. He remained positive about the effects of the world religions course. He believed it taught him and his peers to respect other religions and made them willing to learn about many faiths. But at the reading that night, I also sensed a sadness among the audience, many of whom were members of the mosque in Wayland. Republican presidential candidates already were making bigoted statements about Muslims. Some of those at my reading said they wanted to be optimistic that education could help achieve respect for Muslims in America, and yet, they worried. They worried about what the next headlines would bring and how they could make others understand that they were pious, peaceful Muslims. Omid Safi, an author and religion scholar, wrote about that obligation many Muslims feel to speak out against terrorism in his recent column for On Being. "But I wonder if now, almost 15 years after 9/11, if we should still have to. I don't know how many times we have to keep saying that acts of violence on civilians can never be justified, no matter who is the victim and who is the perpetrator," he writes. Sherry McIntyre, who teaches a required world religions courses to high school freshmen in Modesto, CA, told me that she did not avoid the dark side of religion, especially when she was teaching about Islam in 2001 after 9/11 and in 2013 after the Boston Marathon bombings. She told her students that terrorists are awful people so it shouldn't be a surprise that they drag their religion down with them. "It's people who screw things up, not the religion," she said. Pictured above: Teacher Sherry McIntyre in her Modesto, CA high school classroom. Photo by Linda K. Wertheimer. On Facebook this Monday, she wrote on my page in response to a thread about the recent attacks: Today I came into my classroom feeling much like I did on September 12, 2001... the weight of what we do heavy in the air." She added that she had begun the Judaism unit and as always, was beginning with the story of Abraham and the interconnectedness of the three major monotheistic faiths. It saddened me that Hadia Tirmizi felt compelled to post #Notinmyname on her Facebook page. She and her husband are physicians who came to the United States from Pakistan in the 1990s. They talk about just wanting others to realize that they are simply parents hoping for a good future for themselves and their children. It is a message that teachers around the country are trying to get across as part of world religion courses. Families like the Tirmizis are us. It's not just a message about Muslims. It is a message about any group considered an 'other' in America. This article previously appeared on Beacon Broadside.